Find out everything about the brand Inneov. At the forefront of science and technology, Innèov's food supplements include over 30 patents that result from advanced research in nutrition and skin biology. 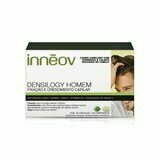 Innèov is a generation of food supplements for skin, hair and nails. 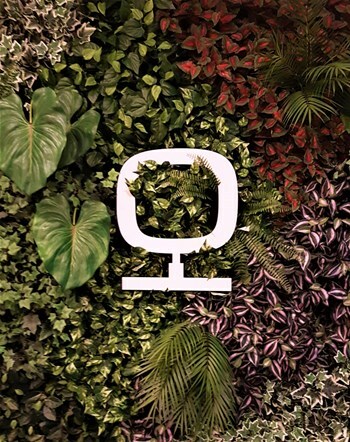 At the forefront of science and technology, Innèov's food supplements include over 30 patents that result from advanced research in nutrition and skin biology. Developed by dermatologists and nutritionists, the Innèov supplements are the most prescribed in the market because of the results. Its unique formulas include selected and dosed ingredients, to ensure total absorption capacity of nutrients to effectively act on the mechanisms of beauty and health of the organism. Each product of Inneov goes through more than 100 quality tests? The safety and quality requirements are certified by ISO 22000, the highest standard of international food safety! With the launch of Densilogy line, Innèov grown up in the food supplements market! An absolutely innovative approach to hair loss that has revolutionized the way of dealing with this problem! The Innèov Densoligy acts on the membrane of fixing the capillary bulb. This membrane is responsible for fixing the hair fiber or as a result for its premature fall. The hair is attached to a membrane located in the hypodermis responsible for the protection and nutrition of the hair bulb. Under ideal conditions this membrane is contracted allowing the fixation of the bulb and their healthy growth. When attacked (+ oxidative stress inflammatory process), relaxes and begins the ejection phase of the fiber which leads to hair loss. 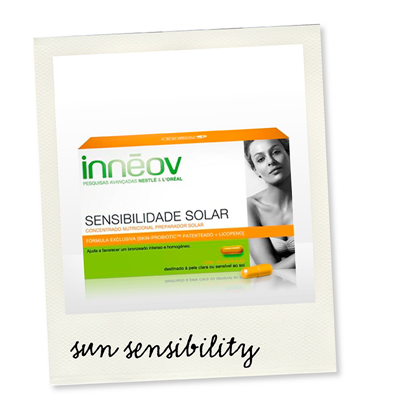 With Innèov Densilogy the membrane remain to the healthy and resistant to external aggressions that promote relaxation. Available in two presentations, Densilogy and Densilogy man with nutrients targeted for Women's and Men's needs. Minimum treatment recommended: 3 months. Who has a balanced diet need to take innéov? The Innéov acts as a complement to a balanced diet, providing nutrients that are sometimes in small quantities in the diet and that are critical to the normalization of cellular processes in the body. With age, the natural production of collagen is degraded, which causes wrinkles, sagging and lack of skin elasticity. 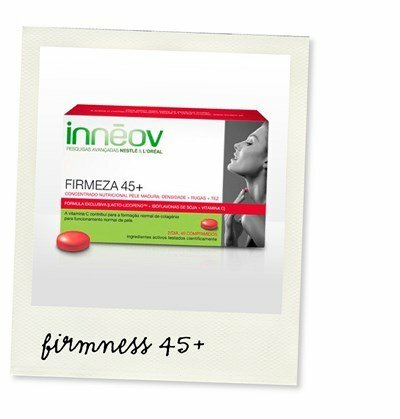 The Innèov released firmness 45+, a food supplement capable of acting from the inside of the skin to resolve the specific needs of skin with visible signs of aging. The Inneov Firmness 45+ brings together a unique set of 3 ​​ingredients: Lacto-lycopene + isoflavones of soy + Vitamin C, able to spread their biological action from the interior to the cells that produces collagen that exists in the dermis, make a triple action : Density + Wrinkles + Forehead, responding to the specific needs of the skin with visible signs of age. Minimum treatment recommended: 6 months. QUESTION: If you already use an anti-aging cream, there will be interest in taking firmness 45+? The anti-aging cream has an action surface, very important to maintain hydration and skin comfort, and its action is immediate. The firmness 45+ formula works from within, reflecting abroad. 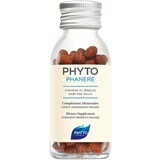 It helps the natural skin functions remain active, producing visible effects on skin firmness. With age, the production of hyaluronic acid can decrease up to 70%. Your molecular weight and your ability to absorb water, reduces, leading to reduction of skin elasticity and the first wrinkles. The Innéov Pre-Hyaluron reissue the synthesis of hyaluronic acid from the inside of the skin through three active ingredients that make up its formula: Glucosamine, Manganese and Hesperidin. 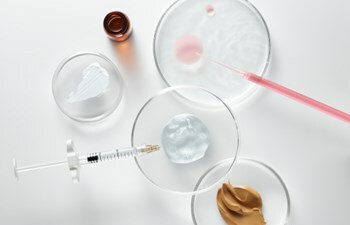 Glucosamine acts as precursor in the production of hyaluronic acid, manganese is an enzyme cofactor that acts as activator in its synthesis and hesperidin has a protective role of the new hyaluronic acid formed. The Innéov Pre-Hyaluron aims the correction of wrinkles in the nasolabial folds (Chinese mustache), wrinkles in the eye contour (feet crow's) face oval sagging, wrinkles on the forehead, wrinkles between the eyebrows (lion wrinkles ), wrinkles on the upper lip (bar code), and wrinkles at the corners of the mouth. The results are impressive! 1 degree over the nasolabial folds! Minimum recommended treatment: 4 months. QUESTION:The Innèov supplements can be used during pregnancy, breastfeeding or for people with some pathology? The Innèov supplements are intended for use by healthy adults. Adults under special conditions (diseases, pregnancy or lactation) should use under the guidance of an expert. The UVA and UVB reduced the antioxidant potential (anti-free radicals) of the skin and chamge the cells responsible for immunity. Skin cells are damaged, the skin becomes more vulnerable. On the surface, the skin becomes red, warm feeling arises, which shows the reaction of the skin to sun aggression. With the accumulation of sun exposure, the skin loses its firmness and elasticity. Inneov Sun Sensitivity is particularly suitable for people with a history of skin photosensitivity, regardless of skin color: frequent sunburn, allergies to the sun, and more! Associates carefully selected nutritional ingredients: Lactobacillus La1 + + Beta-carotene Lycopene, reinforcing the immune defenses of the skin, improving the skin's tolerance to sunlight and promotes a healthy and uniform tan.. Treatment recommended minimum: 2 months. The products have proven results? Yes, innéov has clinical studies that support the results of its products.